FIXED PAY ANGE MANANIYA RAJYAPAL MOHODAYA SHREE NE LAKHEL MAIL NO JAWAB ..............! Sub : Reg. 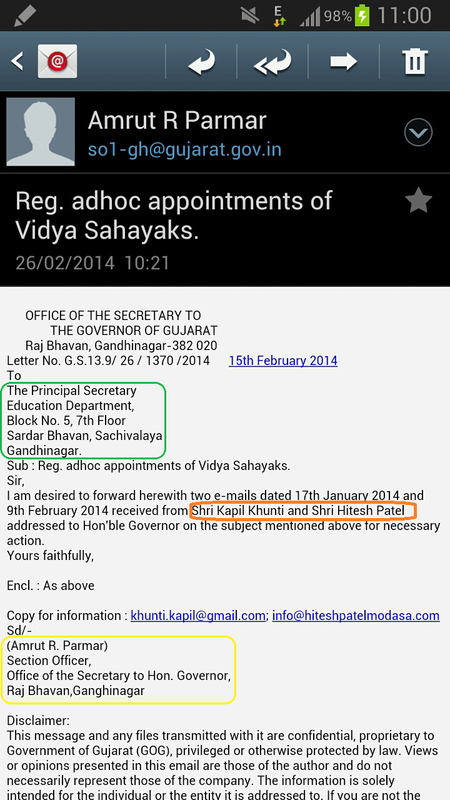 adhoc appointments of Vidya Sahayaks. I am desired to forward herewith two e-mails dated 17th January 2014 and 9th February 2014 received from Shri Kapil Khunti and Shri Hitesh Patel addressed to Hon'ble Governor on the subject mentioned above for necessary action. This message and any files transmitted with it are confidential, proprietary to Government of Gujarat (GOG), privileged or otherwise protected by law. Views or opinions presented in this email are those of the author and do not necessarily represent those of the company. The information is solely intended for the individual or the entity it is addressed to. If you are not the intended recipient of this message, you are not authorized to read, forward, print, retain, copy or disseminate this message or any part of it. If you have received this email in error, please notify the sender immediately by return email and delete it from your computer. The company accepts no liability for any damage caused by any virus transmitted by this email. This message contains confidential information and is intended only for the individual named. If you are not the named addressee you should not disseminate, distribute or copy this e-mail. Please notify the sender immediately by e-mail if you have received this e-mail by mistake and delete this e-mail from your system. E-mail transmission cannot be guaranteed to be secure or error-free as information could be intercepted, corrupted, lost, destroyed, arrive late or incomplete, or contain viruses. The sender therefore does not accept liability for any error or omissions in the contents of this message, which arise as a result of e-mail transmission. ગુજરાતના સરકારી કર્મચારી ઉઠો જાગો નહિતર ઉઠવા લાયક નહિ રહો. આજ સમય છે બઘાએ એક થઇને કઇક કરી બતાવવાનો, ભ્રસટાચાર રોકવાનો. સરકારી કર્મચારીનો વિકાસ કરવાનો. જો હાલ વિચાર કરવા રહેશો તો આખી જીંદગી વિચારતા રહી જસો. 26 તારીખે કર્મચારી સંકલન સમિતિ ના હોદેદારો સાથે થનાર માનનીય મુખ્યમંત્રીશ્રીની બેઠક રદ થઇ છે. ગુજરાતના સરકારી કર્મચારી ઉઠો જાગો નહિતર ઉઠવા લાયક નહિ રહો. આજ સમય છે બઘાએ એક થઇને કઇક કરી બતાવવાનો, ભ્રસટાચાર રોકવાનો. સરકારી કર્મચારીનો વિકાસ કરવાનો. જો હાલ વિચાર કરવા રહેશો તો આખી જીંદગી વિચારતા રહી જસો. 26 તારીખે કર્મચારી સંકલન સમિતિ ના હોદેદારો સાથે થનાર માનનીય મુખ્યમંત્રીશ્રીની બેઠક રદ થઇ છે. કર્મચારીઓ સાથેનો 26 તારીખનો વર્કશોપ મોકૂફ - ગુજરાતના સરકારી કર્મચારી ઉઠો જાગો નહિતર ઉઠવા લાયક નહિ રહો. આજ સમય છે બઘાએ એક થઇને કઇક કરી બતાવવાનો, ભ્રસટાચાર રોકવાનો. સરકારી કર્મચારીનો વિકાસ કરવાનો. જો હાલ વિચાર કરવા રહેશો તો આખી જીંદગી વિચારતા રહી જસો. 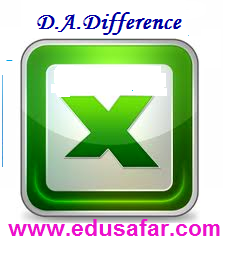 Friends, here I am going to provide you an excel sheet.The name of the sheet is " D.A.Difference Calculator-2013 ". It will be very useful to calculate D.A.difference. It is easy to calculate. You can calculate 3% increment, too. To download click under mentioned link. Current Affair and is the third part of the broadcast. The General Assembly is over. MCQ questions based on current events have been placed. Pareshbhai Chavada the questions that have been creating. 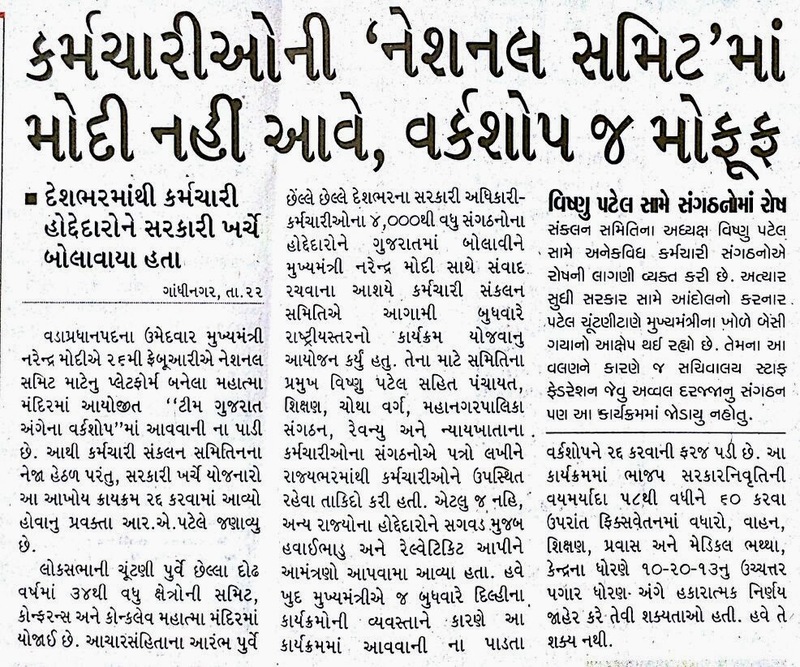 The questions are in Gujarati. 25 questions game is launched. You know it is a game to play. LMG Arun font are used. Would your response..
Current Affair made ​​the game has created new questions. It is to these questions Pareshbhai. Edusafar from the game have been placed. This week is built into the event -based questions. A seven-day questions. The questions for your general knowledge will be very useful. Hello! 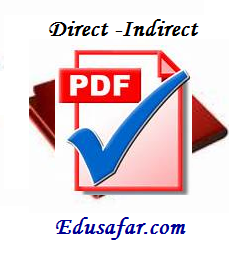 Friends, I'm going to connect you with useful grammatical topic 'DIRECT INDIRECT SPEECH'. This PDF is prepared by my fast friend P.R.Patel. He works as an English Teacher at H.P.High School, Unava. 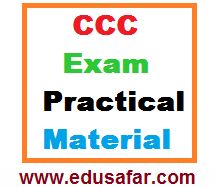 This material is very useful to English Teacher as well as students. In this material there are simple rules about Direct Indirect Speech, through which students can learn Direct Indirect Speech easily. To download click under mentioned link. 1 of 20 general knowledge quiz game we have seen. The general knowledge of the game is to put 21 to 25 Gujarati. Play a step-by-step. Play of the game's first 21. After 22 Play of the Game. Then, 23, 24, and 25 of the game play. Welcome to Edusafar. Thank you for all that you have to EduSafar. What can be done to improve general knowledge? This question and from Edusafar General knowledge in Gujarati game started strong. Yes, today is very competitive in exams. General knowledge and it is always the same. If we have questions from contributor Bharad Foundation. We should put it as a game.